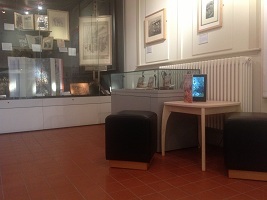 Project dates: October 2012 – April 2013 Original artwork by C.A Tunnicliffe RA for the Ladybird series was scanned.Visitors can sit to look through them on the iPad, tapping the animals to hear their sounds. We have also recorded the text on the exhibition’s posters which visitors can hear by tapping. Thanks to the University of Reading Special Collections and to the Ladybird publishers (Penguin) for permission to use the images.